"Natusch tackles #MeToo topics such as sexual assault and domestic violence, never talking down to her readers or offering easy answers. The terrifying finale is a doozy, and Ky is a capable (can you say muay thai? ), whip-smart, snarky joy. Readers will follow her anywhere, no matter how dangerous...Dark and thrilling. " "A witty, fast paced, action-packed romp through the seedy underbelly of small town America. Kylene's spirited voice leaps off the page! Beware: once you being this thrilling ride, you'll be up way past your bedtime." "Dare You to Lie filled the empty spot Veronica Mars left in my heart. A smart who-done it that kept me guessing to the end! I can’t wait for the next book." "A quick-witted heroine, a fast paced plot, and a twisty whodunit mystery that kept me on my toes. Fans of Riverdale and Veronica Mars will adore Kylene Danners and devour this suspensful story"
-USA Today Bestselling author K.A. Tucker. 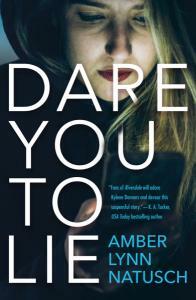 "Amber Lynn Natusch's brillian and fast-paced storytelling shines through in her strong, good-girl-turned-raw heroine, Kylene Danners. Natusch weaves in sharp-witted dialogue for her well-developed characters, creating everything from behind-the-hand giggling to full-out barking laughter as I turned the pages. Read this book the way it was meant to be read: consumed in one sitting. Once you do, you'll be clamoring for more." "Equal parts fierce and funny, Kylene Danners is the friend you wish had your back. Natusch throws the reader into a pulse-quickening quest for justice that left me whiplashed in the best possible way. I want—no, need!—to see what Kylene does next!"